It’s that time of the year again. Movember – a November month long campaign to raise awareness of men’s health. And this is my new favourite ‘stache sported by the one and only, dapper David Forsyth. David Forsyth was born in 1852 in Perthshire, Scotland. He came with his parents to Canada at the age of one year old. He attended Dundas High School and later graduated from Galt Collegiate. In 1875, Forsyth completed his studies at the University of Toronto with a silver medal standing in mathematics. Forsyth, in the following year, joined the staff of the Berlin High School as a teacher of mathematics and science. 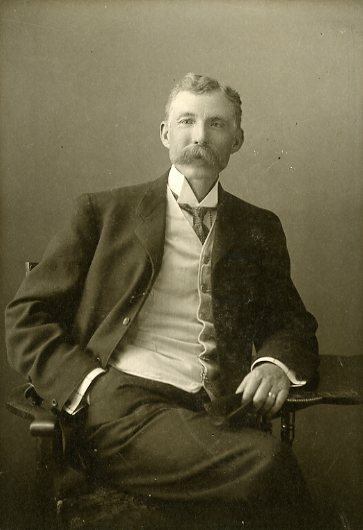 In 1901, he succeeded James W. Connor as Principal. As an educator, Forsyth was the first in Ontario to introduce practical laboratory work for science students in high school. Under his leadership, the Berlin High School grew in staff, attendance and equipment, putting it in the front ranks of Ontario schools. Prominent graduates included future Prime Minister, William Lyon Mackenzie King and W.D. Euler, North Waterloo Member of Parliament and Minster of Trade and Commerce. Forsyth also served on a Royal Commission on Industrial Training and Technical Education, which travelled around the world gathering information for its report. His connection to the Kitchener Public Library was as a board member for over 30 years, many of which were spent as Secretary and four terms as Chairman. He was also instrumental in securing land for the Carnegie Library building at Queen and Weber Streets. Additionally, he was a member of the Berlin Board of Health, Waterloo Historical Society and Mathematical Association of Canada, American Association of Science and the National Geographic Society. David Forsyth was also well known in sporting circles as a member of the Berlin football (soccer) team, which later became the Rangers. He was responsible for organizing the Western Ontario Football Association in 1880, serving as secretary, president and honorary president. Forsyth was a captain of the Berlin lacrosse team, a prominent member of the Berlin Cricket Club, an avid cyclist, enthusiastic canoeist, lawn bowler, and curler. He was married to Augusta Mylius in 1882, who died in 1912. Upon his retirement from the Berlin High School in 1921, Forsyth went to live in Beamsville, ON where his son, Otto, resided. He died on 13 September 1936 in Beamsville and was buried at Mount Hope Cemetery in Kitchener. A classy man and moustache, don’t you agree?